My first thought was to copy the “MAGA” formula exactly, and one early contender in that vein was “Make America Gray’s Again” — but that seemed too “arrogant and megalomaniacal” even for me 😃. (If you’re not sure about the “arrogant and megalomaniacal” references, you definitely need to listen to the musical introductions above.) Plus, it would need to be somewhat different so as not to confuse people too much. None of those really fit the bill, though, do they? Maybe this is one reason why I wouldn’t be very well-suited to politics. I’m sure if I were at all serious about running for office, I would bring some smart people into a room and come up with something. But at the moment, if I were serious, I might just turn things around and have my campaign be about GAMA: Giving America Meaning Again. What do I mean by that? Reminding us that the USA was “brought forth on this continent” for freedom, and that the steps we’ve been taking toward statist control are anathema to freedom. Reminding us what “life, liberty, and the pursuit of happiness” mean — and what they don’t mean. Reminding us what government is supposed to do — and what it’s not supposed to do. If, that is, anyone would ever want to listen to another voice crying in the wilderness. 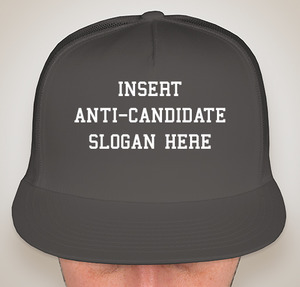 So, if you were an adviser to the Anti-Candidate, or on the Anti-Campaign team, what would you suggest as a good slogan? 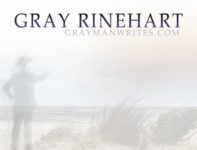 Don’t forget: As noted here, I’ve been running a series of giveaways for Audible downloads of the Walking on the Sea of Clouds audiobook, and the last drawings will be held this Monday, the 15th of April. Sign up at this link! 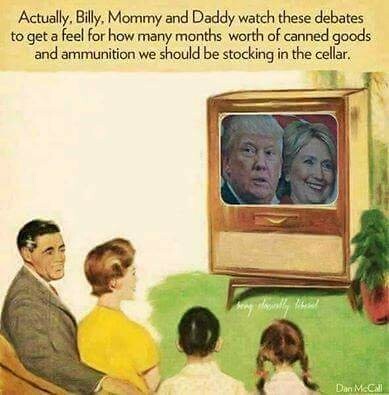 First, a confession: I didn’t watch all of Monday night’s debate. I missed about the last half hour, I think. Both candidates talked a bit about the National Debt. Mr. Trump made the point about how large it is now, without driving home the point that it is much larger now than it was eight years ago. Mrs. Clinton made the point that Mr. Trump’s proposed tax cuts would add to the debt, without explaining whether her proposed tax increases would actually reduce it. But the moderator missed an opportunity to ask them one simple question: Are you going to balance the Federal budget every year? Because if not, then you’re not going to reduce the National Debt. Mrs. Clinton scored some points with the “Trumped Up Trickle-Down” phrase, and she praised her husband with respect to the booming economy we enjoyed during his Presidency. Then, however, she made the curious statement that trickle-down economics led to or was responsible for the recent recession. I found that curious because trickle-down economics was not a hallmark of George W. Bush’s 2001-09 term; it was a hallmark of Ronald Reagan’s 1981-89 term. If trickle-down economics lasted until the 2008 recession, then, that would imply that the economic policies of the intermediate terms didn’t count for much. Mrs. Clinton also scored points by pressing Mr. Trump about his company’s failure to pay suppliers for services rendered. I would like to know the story behind that, and the terms of the agreements that were violated — or that were negotiated so strongly in favor of the Trump conglomerate. The two of them had a lot to say about policing, but policing is a local issue rather than a Federal one. It would have been nice to have them discuss whether they think the Executive Branch has a role in local matters, and if so what that particular role might be, rather than hearing about whether “stop and frisk” was or was not effective when it was in place in New York City. The crime and gun control portion was one of Mr. Trump’s missed opportunities. A simple question that he could have asked: How many criminals and gang members have ever gone through a background check in order to purchase a firearm legally? The question about cybersecurity was another missed opportunity. Mr. Trump certainly did not display any sort of killer instinct, or he would’ve pointed out the irony of someone trying to come across as knowledgeable about security who could not recognize that paragraph markings in a message denoted classified content; alternately, he could’ve asked about how increased cybersecurity might have protected mishandled emails that, it turns out, included very highly classified information. Also on my list of things I wish Presidential candidates would talk about in order to show that they understand or at least appreciate National Security and military-related issues: the DIME: the instruments of National power. In the end, I was disappointed that the smaller-party candidates had not crossed the threshold of making it onto the debate stage. That might have been more entertaining, and almost certainly more enlightening. It is easier, of course, to talk about playing the game than it is to play the game: to analyze the debate afterward than to participate in it in real time. It may be that if I had the chance to debate I would not have fared any better. Then again … I think if I had a team of people to help prepare me and quiz me, I would be able to hold my own. Put me in, Coach. I’d love to take a swing at it. P.S. I’m the Anti-Candidate, and I approved this blog post. Especially if you want your faith in government restored! Yes, it’s that time again! Time to consider whether you’re going to vote for an establishment candidate, an alternative candidate, or — if you’re really bold — the Anti-Candidate! You may want to “throw the bums out,” but be careful you don’t vote a bunch of new bums in. At least this bum is honest about being a bum! And if you don’t believe me, take a listen to “I Think I’ll Run for Congress”. I’ll get my name in the papers and my face on your T.V. I am the Anti-Candidate, and I wrote, edited, approved, and posted this message. And if you decide you want to vote against both sides, I am as always available as your convenient write-in vote. I’m the Anti-Candidate — or, if you will, the “well-meaning fool” — and I approved this blog post. *The “Notebooks” were included in Heinlein’s novel, Time Enough for Love. Comments Off on Missourians, You Have Another Choice: the Anti-Candidate! 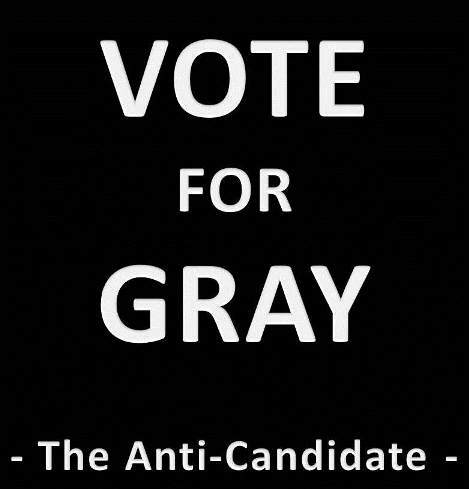 If you can’t find anyone you want to vote for, you can always write in the Anti-Candidate. … we’re not on the ballot for … any elected office (so far as we know). You won’t see our name on those irritating little signs in your neighborhood. You won’t see any obnoxious “I approved this message” ads on television. In fact, if you’re committed to one party or one issue and you find a candidate who will represent you adequately, we encourage you to vote for that person. You can read more on the Anti-Campaign page. I’m the Anti-Candidate, and who else in their right mind would have approved this message? So many blog-able things, so little time. First, do you consider yourself conservative or liberal? If you answered “yes,” then you’re a person after my own heart. That’s the Anti-Candidate’s position, too, as seen here. That is, the anti-candidate is conservative on some things, and liberal on other things. So far as we can tell, the anti-candidate is conservative and liberal on all the right things. And finally, progress on the novel has stalled. Last night I had an idea of something to add, and I’m struggling with whether it’s a good idea or not. I may have to leave a big block of white space labeled “figure it out later” and move on. It’s very frustrating. But, life goes on. At least until it doesn’t. Happy Autumnal Equinox, one and all. Today’s subject comes courtesy of the Anti-Candidate Position on Energy, just posted on the forum. Long-term energy needs require long-term energy solutions, and petroleum is not a long-term solution. Fossil fuels in general aren’t long-term solutions, because we’re not making enough fossils these days to replace the fuels. Interested parties can find it here. The post just prior to that one, incidentally, is the Anti-Candidate Position on Free Speech. Basically, it’s a good thing — but free speech doesn’t automatically mean easy speech. Today in space history, 1993, the Space Shuttle Discovery landed at Kennedy Space Center at the conclusion of mission STS-51. Fabianspace is run by Karina Fabian, a talented writer whose husband Rob was a speechwriter with me on the Air Staff and is now a Squadron Commander at Minot Air Force Base, North Dakota. Karina agreed to be the Anti-Running-Mate in the Anti-Campaign, and posted a fake news story about the Anti-Candidate on the same “Labor Day Funnies” page of her blog. I suspect Rob had a hand in producing that segment.